Help Welcome our Cardinals and Bishops – Walk-in registration available for historic pro-life conference starting tomorrow – Free Childcare both days! Join us for just one talk, Mass with the Cardinals, Saturday evening concerts, or the whole weekend! 48 safe-environment cleared volunteers have stepped forward to provide conference attendees with free childcare both days! As a special honor, Jesus in the Most Blessed Sacrament will be exposed for Adoration throughout the conference. Want to know what talks are being presented and when? The schedule is available here. Both English and Spanish tracks! Dates: TOMORROW, August 17 and Sunday, August 18 • Location: Plano Centre, Plano • Cost: $30 per person, $20 per youth 12-18. Clergy, religious, seminarians and children 12 and under may attend for free. Congress keynote speakers include Archbishop Gustavo García-Siller of San Antonio, Bishop Jaime Soto of Sacramento, Bishop Mark Seitz of El Paso; 20 breakout session talks feature experts on issues of life, family and bioethics. Masses will be celebrated by Cardinals Seán Patrick O'Malley of Boston and Daniel DiNardo of Galveston-Houston. And Father Jesús Belmontes and Alas will perform in a memorable concert! See you at the Plano Centre! Walk-in Registrations Welcome!
. For more information about 40 Days for Life-Dallas, see prolifedallas.org/40days. 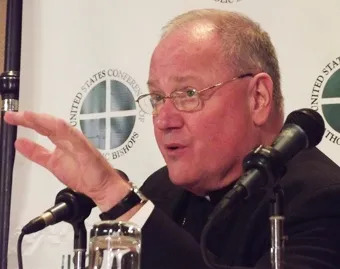 At a recent Knights of Columbus event, Cardinal Timothy M. Dolan of New York and other Church leaders warned against the tendency to “discard” society's marginalized, including immigrants.